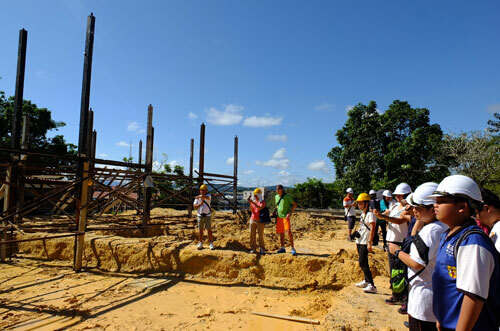 SITE VISIT: Students witnessing the reconstruction of Fort Alice. BUILDING BLOCKS: Pieces of timber to be used in the reconstruction of Fort Alice. FORT Alice has been left to the mercy of the elements after outliving its usefulness as a military outpost, built by Charles Brooke, the second White Rajah, more than 100 years ago to defend Simanggang (now Sri Aman) against attacks by warring tribes. After being abandoned, its dignity as the Division’s bastion of defence during a turbulent period in Sarawak’s history descended to the crass level of “a local den for drug addicts.” And parents were quick to warn their children to stay away from the crumbling building for fear they may get injured by falling shards – or harmed by drug addicts hanging out there. The long-forgotten over a century-old Fort (kubu) has also been described as being dressed down layer after layer like superfluous decks of outer dresses, coats, petticoats and shifts, worn by vain Victorian era ladies as they endeavoured to become the most wooed debutantes at court. Passing through different hands and transcending time, the Fort had been given several facelifts to suit the needs of different owners – or simply follow prevailing trends. Some added rooms and some added extensions, thus upping the ante for the restorers to bring the original shine back to the worn-down Fort. Before the start of the restoration project, the Fort resembled a two-storey wooden bungalow although there are ample proofs to show it was a wooden structure built on stilts. During its heyday back in 1864, Fort Alice was the centre of Simanggang town, bringing life to the surrounding jungles and riverbanks. Identifying the different add-ons and dismantling the Fort is a delicate procedure so as not to damage the existing architecture. The original structure is hardier than the newer added on materials, making it easier to tell the old from the new. The dismantled parts were carefully inspected and labelled while some of the rotting timber replaced and the still hardy materials reused. Since the restoration project started in May, the whole Fort has been dismantled and replacement parts will be fitted together piece by piece – like building a house from Lego blocks. 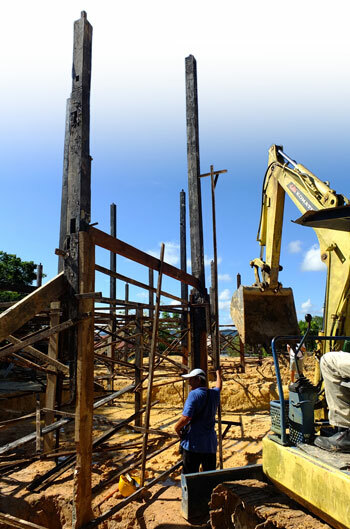 According to architect Mike Boon, consultant for the Fort Alice restoration project, progress has been made with the contractor having already put up the main framework. The structure sits on a new reinforced concrete pad footing and some of the buried decaying lower parts of the columns which have spliced on the existing woodwork, have been replaced with new belian materials. “The columns have irregular connections because when the originals were coated with modern acrylic paint or bitumen, it was not permeable (the timber can’t breathe) and rotting started to occur from the inside, moving upwards. That’s why we are replacing the bottom parts of the columns. “We cut away the rotted parts bit by bit until we reached the solid part of the old column. Then we made a new piece of timber with the same shape and slotted it in like a jigsaw piece,” he explained. Some of the bottom column parts, requiring bigger belian pieces, are left hanging with the help of props because the new parts have not arrived yet. If not propped up, reconstruction will be delayed because all the parts are interlocked with bearers tying the frame together. When the bigger timber arrived, all that had to be done was slotting them in from the side, Boon said. The next step is putting in the floor joists which is expected sometime in December. GROUND UP: Reconstruction of Fort Alice is making progress. CLOSE-UP: Students getting a closer look at how tar is poured into the wood and the excess scraped off. 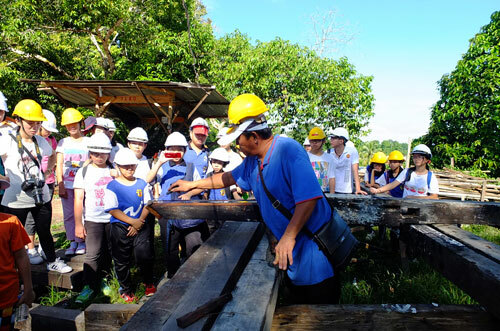 In November, Boon brought 40 local students on a tour of the project site. They are participants of a community engagement programme called Reminiscing Forgotten Treasure – Simanggang which involves a series workshops by local historian Goh Kaw Sze. The tour – the fourth to be organised – comprised first, second and third timers to the site. The number has more than doubled the 18 students from the initial site visit. The students were shown how plant-extracted tar was melted and how parts of the timber were covered with it. The purpose is to prevent water seeping into the wood. This is important since the timber parts will be planted in the ground while the face of the timber and the joints exposed to the elements. Even the bolts have to be dipped in tar. As the tar was very hot, the students were cautioned not get too close. Tar was poured into the spliced timber and the excess scraped off and once cooled, it will solidify and caulk the gaps. Thick oil will be painted on the column face to make it waterproof. The timber will soak up the oil slowly, just below the surface of the wood, and will be repainted with thick oil over time to create a thicker waterproof layer. “Paint is not a good idea because it will not bond but peel off over time. Besides, constant repainting will cause the layers to crack, allowing water will seep in and cause bubbles on the surface of the wood and affect the timber,” Boon said. The second hands-on process was lime-wash. Research shows the Fort had been lime-washed before. It was the finishing used during that time – before the invention of modern paint. Boon said the method was introduced by the Brookes and usually used on masonry up to 1960. Based on the illustrations left by the Brookes, there was a formula for a waterproof lime-wash as an exterior coating. Further research reveals the formula originated from Queensland, Australia, and the waterproof version was introduced after government officers at the time complained about the hassle of lime-washing the Fort every year. Based on the recipe, glue is needed besides lime and water but there is no specific ratio for the ingredients. Thus, a series of experiments was necessary to ascertain the correct quantity. “The original lime-and-water recipe produced weak bond and there was no clear indication what the glue really was. In Vietnam, cowhide or cartilage gelatin is used. So we include cowhide gelatin in our experiments. Other items used are soap and starch,” Boon disclosed. Boon said too much cowhide gelatin would make the mixture impermeable, hence defeating the purpose of the wash.
During the experiments, the students got to mix lime and water and see how the mixture bubbled and gave out heat when mixed. They also got to smell and touch the cowhide gelatin, and see first-hand the melted cowhide, water consistency and colours. The different recipes were exposed to the elements to test the effectiveness of the lime-wash. The best results will be used on the Fort later. The students were also given the opportunity to touch the different mixtures as well as paint the lime-wash on pieces of wood. This was followed by a third experiment to show how timber is cured or seasoned by boiling belian materials for four to six hours. When boiled, the hard wood leaks red sap. The students were shown samples of the red sap at different boiling stages. The colours varied from light reddish to almost dark brown. “We need to season the wood claddings (wall planks) before using them so that when we paint the lime-wash, they will not turn red,” Boon explained. Boon’s son, David, an architecture student, visited the site for the first time and really loved the trial-and-error part of the project in contrast to modern construction which adherers to strict guidelines. “Modern construction uses premix and modern materials but for Fort Alice, it’s experimental,” David noted. The 20-year-old knew about the programme through her mum and it coincided with her semester break. “I learned many new things during the site visit – like using tar to join the spliced wood pieces and I look forward to the next visit to learn more about this historical building right in my own backyard. Even my parents do not really know much about the Fort, apart from its name,” she said. Second timer Desmond Kii of SJK (C) Chung Hua Simanggang loves participating in the programme because “it is very hands-on” and he can learn traditional carpentry skills from it. As the 11-year-old loves history, he wants to know about the beginning of Fort Alice so that he can tell his parents what he has seen and learnt. “My parents don’t really know much about the history of Fort Alice and now they will learn more about it from me,” he said. For fourth-timer Yvonne Derrick Warren of SMK St Luke, she decided to take part in the programme out of boredom but is now looking forward to the next site visit. “Previously, Fort Alice is known as a local haunt for drug addicts and my parents warned me not to go near it as the building was crumbling down and I may get hurt. Also, there may be drug addicts using the place,” the 15-year-old said. “Reminiscing Forgotten Treasure – Simanggang” is 100 per cent NGO-run, involving the Sarawak Heritage Society, PAM Sarawak Chapter, Soon Heng Society, the Sarawak Museum and Talents and Arts Performing Group Kuching. The CSR sponsor is NS Bluescope Lysaght (Sarawak) Sdn Bhd. All the processes and procedures on the work done on Fort Alice are recorded on the blogs [email protected] and johntingarchitect.blogspot.com.